20160523 - Up in to work and getting the place ready for a bunch of visitors tomorrow. Headed home and got G. We stopped at an auction pickup place in Gahanna to get some things we had won online. On to practice and the boys did good. 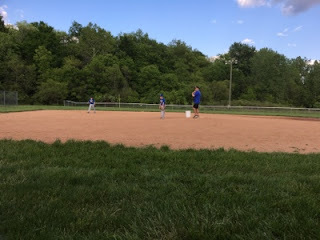 D had baseball practice tonight. Home and helped Doc with his garage door and then on to Bible Bangers. Small crowd tonight so it was short and sweet. Home and up late working on OhiOOddities.